Heat the oil in a wide frying pan over a gentle heat. Add the onions and fry gently, stirring frequently, until translucent. They should be softened and not browned. Don’t rush this stage – it should take about 10 minutes. Add the garlic and cook for a further minute or so to soften. Tip in the tomatoes and the tomato paste and stir. Add salt and freshly ground black pepper, sugar and the bay leaf.Bring up to the boil, then reduce the heat and simmer very gently for 15-20 minutes, stirring frequently, until the tomatoes have reduced down to a thick sauce. You may need to add a little water to prevent it from catching. When the sauce has been simmering for 10-15 minutes, bring a large pot of well-salted water to the boil and cook your pasta according to the packet instructions. When the pasta is cooked, drain. When the sauce is cooked, taste for seasoning and add salt and freshly ground black pepper . When you’re ready to serve it, add the cheese to the sauce. Add basil to the sauce, then turn off the heat from under the sauce. Remove the bay leaf . 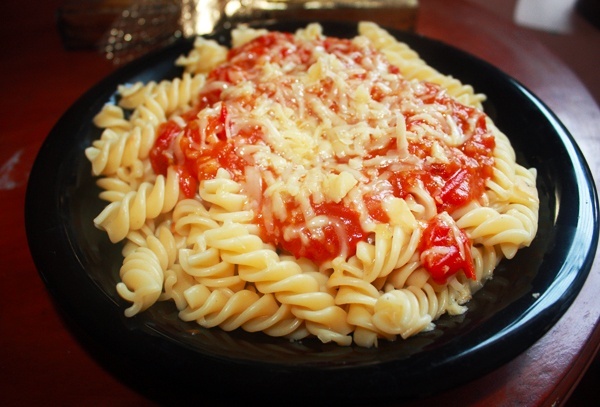 This entry was posted in All Recipes, Pasta and tagged Pasta Sauce, Quick Food by Kamakshi. Bookmark the permalink.